Rheinmetall has offered a special version of the Boxer to Australia as participation in the LAND 400 program. The Boxer Combat Reconnaissance Vehicle (CRV) is a version of the Boxer IFV with Lance Modular Turret System (Lance MTS), a version already showcased earlier in 2012 on the Eurosatory defence expo. Rheinmetall is partnering with Northtrop Grumman in order to increase chances of winning the contract. The Boxer CRV is armed with a MK-30/2 ABM autocannon and an anti-tank missile system, which yet has to be disclosed. The MK-30/2 ABM gun is chambered in the 30 x 173 mm caliber and is gas-operated. It is dual-belt fed and has been equipped with an additional magnetic coil to allow the use of programmable air-burst ammunition. For this the muzzle velocity of the fire round is measured and via the magnetic coil the timer inside the projectile is set, which should result in a higher precision of the air-burst. Available ammunition includes armor-piercing APFSDS, KE-TF (air-bust fragmentation against infantry), FAPDIS (frangible armor-piercing) and PELE (Penetrator with Enhanced Lateral Effect) ammunition. As secondary armament a 7.62 mm machine gun can be fitted coaxial to the main gun. The Lance MTS is fitted with two Rheinmetall SEOSS sight units, which both include a day-channel aswell as a third-generation thermal imager. One of the sights is mounted at the front of the turret, whereas the other one is placed on top of the turret. Furthermore the Lance turret might be fitted with two units of Rheinmetall's Situational Awareness System, which provide a 360° view of the close proximity. 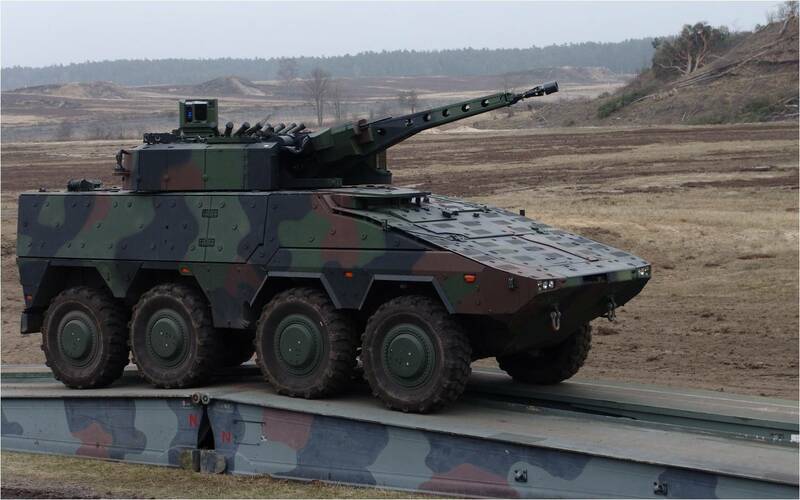 In one trailer from Rheinmetall, the Boxer CRV has been fitted with SAAB's Barracuda Mobile Camouflage System. The Boxer MRAV (multi-role armored vehicle) is the final result of a program, which originally was iniated by Germany, France and the UK to build a heavily protected common wheeled multi-role platfrom for all three countries. The Boxer is a modular vehicle, allowing to adopt different mission modules on the same chassis. It is well-protected by AMAP composite armor and fitted with a high level of built-in mine and IED protection.